Laid down, 23 August 1962, at Marietta Mfg. Co., Point Pleasant, W.VA.
136k Namesakes Benjamin F. Sands, born in Baltimore on 11 February 1811, was appointed Midshipman in the United States Navy on 1 April 1828. By 1834, he had served on the Brazil Station and in the West Indies and Mediterranean squadrons. From 1834 to 1841, he was engaged in coastal survey work and during the mid-40's was attached to the Bureau of Charts and Instruments at the Naval Observatory. During hostilities between the United States and Mexico, he was attached to the Home Squadron and served off Tabasco and Tuxpan. In the 1850's, he commanded the steamer Walker in the Gulf of Mexico on coast survey duty and invented a deep sea sounding apparatus and other hydrographic instruments. Commissioned Captain in 1862, he served off the west coast on survey duty until 1863, then joined the North Atlantic Blockading Squadron as commander of Dacotah. In February of that year, he participated in the engagement at Fort Caswell. He remained off the Carolinas for another two years, commanding the steamer Fort Jackson during the attacks on Fort Fisher. In February 1865, he was transferred to the West Gulf Blockading Squadron and assigned to duty off the Texas coast. Through the end of the Civil War, he commanded a division off that coast; and, on 2 June 1865, took formal possession of Galveston for the Union. 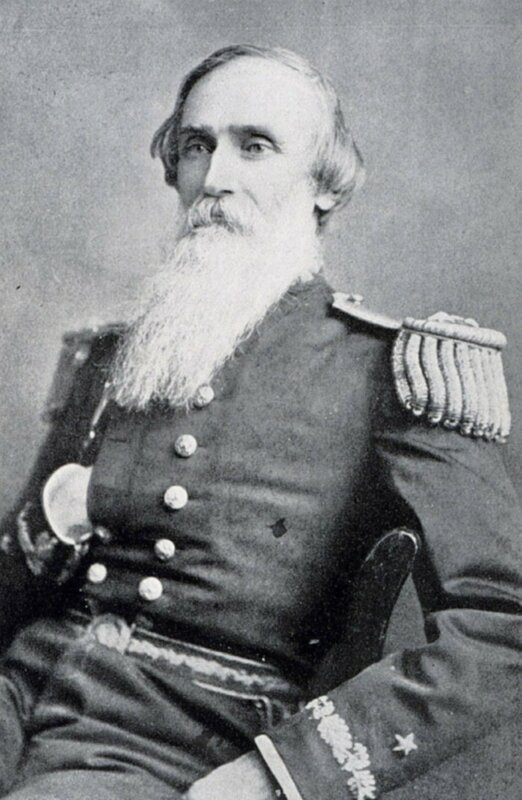 After the war, Sands, appointed Commodore in July 1866, served at the Boston Navy Yard until returning to Washington as Superintendent of the Naval Observatory. Commissioned Rear Admiral on 27 April 1871, he remained at the Observatory until he retired in 1874. Rear Admiral Sands died in Washington, D.C., on 30 June 1883. James H. Sands, son of Rear Admiral Benjamin F. Sands, was born in Washington, D.C., on 12 July 1845 and was appointed Acting Midshipman in the United States Navy on 25 November 1859. During the Civil War, he served in Tuscarora, Juniata, and Shenandoah and, in the years which followed, in Hartford and Richmond. Ordered to the Naval Observatory in 1869, he returned to sea duty, on the Asiatic Station, a year and a half later. From October 1873 to April 1875, he served in the Hydrographic Office. Duty in Minnesota and Iroquois followed; and, in 1884, he returned to Washington, D.C., for duty at the Navy Yard. During the 1890's, he commanded Monongahela; served as equipment officer at the Boston Navy Yard; commanded Columbia and Minneapolis; and served as Governor of the Naval Home at Philadelphia. Detached from the latter in 1901, he became a member of the Retirement Board and assumed its presidency in 1902. Commissioned Rear Admiral the same year, he served as Commandant of the Navy Yard, League Island, Philadelphia, from May 1902 to April 1903; commanded the Coast Squadron until 1905; then assumed duty as Superintendent of the Naval Academy. Further duty on the Retirement Board and as President, Naval Examining Board, followed; and, in July 1907, he transferred to the Retired List. Rear Admiral Sands died in Washington, D.C., on 27 October 1911. 178k USNS Sands (T-AGOR-6) underway, date and location unknown. 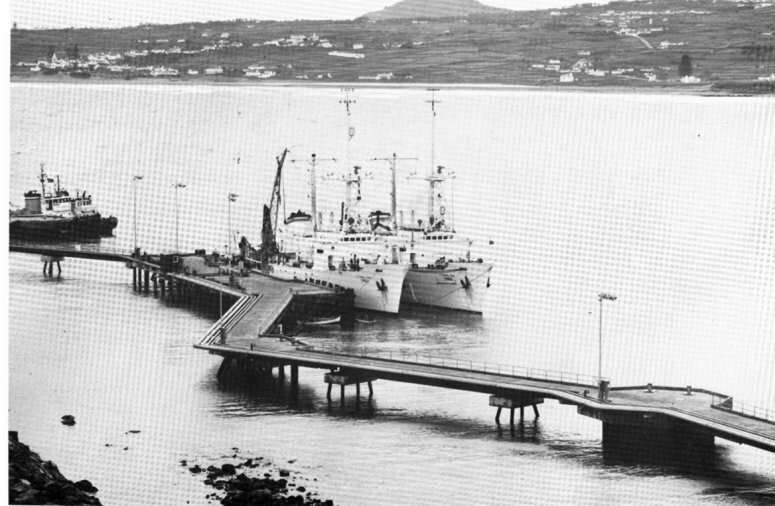 83k USNS Sands (T-AGOR-6) pierside, outboard of Lynch (T-AGOR-7), date and place unknown. US Navy photo from DANFS. Joe Radigan MACM USN Ret.